The Liquid Robotics Wave Glider SV2 is an autonomous vehicle designed to observe the surface ocean for extended periods of time. By utilizing differential orbital wave motion between the surface float and the sub-surface sled the glider can move without using any battery power for propulsion. Solar panels ensure a steady power supply for the science payload and the navigation equipment. 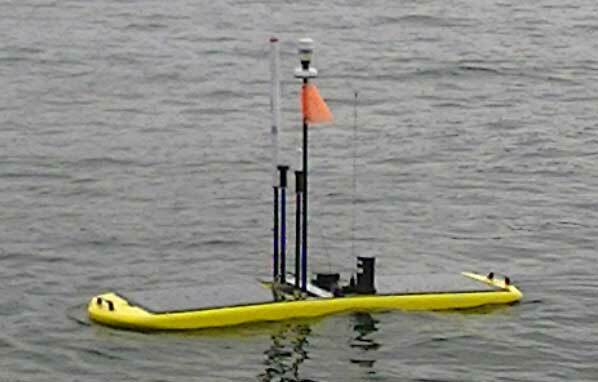 OTN’s Wave Glider, named DL after David Lilienfeld, was purchased primarily to upload data from bottom-mounted acoustic receivers that detect tagged marine animals as they pass by. After uploading the data via acoustic modem, the Wave Glider transmits the data back to OTN over the Iridium satellite network. As the Wave Glider is equipped with VEMCO VR2C hydrophone it can also act as a mobile receiver for any tags in the vicinity. While performing these duties the onboard meteorological, physical and biogeochemical sensors collect data and transmit them every 10 minutes for near real time observing of the ocean.